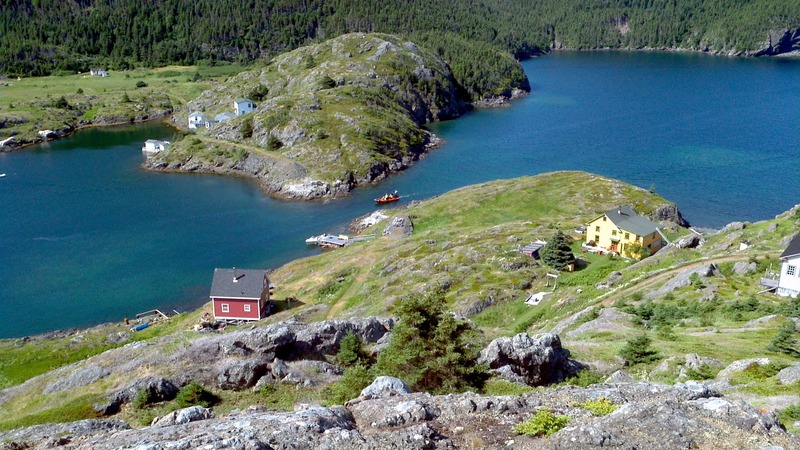 The resettled community of Exploits in Notre Dame Bay, consists of two islands, Exploits (western island) and Burnt (eastern island), and two main harbours, Upper (southeast side) and Lower (northwest side), between them. 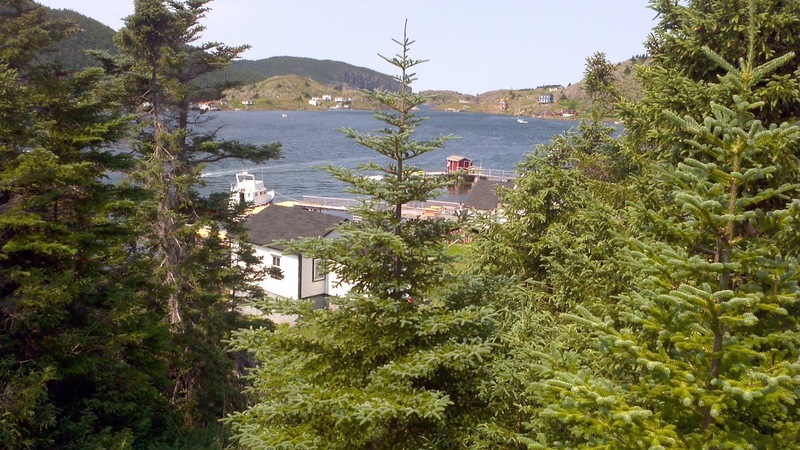 The population was near 1000 people around 1900, but the Newfoundland government relocated the residents of many outports from the mid fifties to the mid seventies, including Exploits. It has since become a popular location for summer cottages, and visiting boaters. My mother's family has roots there going back to the early 1800s. 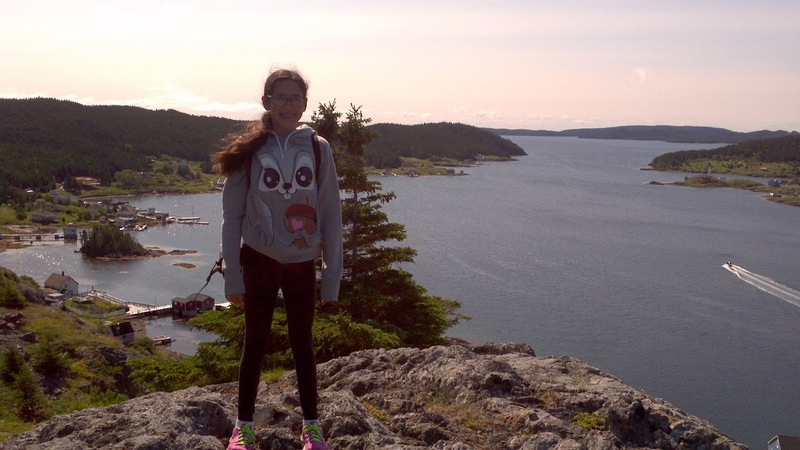 My sister and niece are visiting from Ontario, and over the weekend we went out to Exploits Islands for two nights. 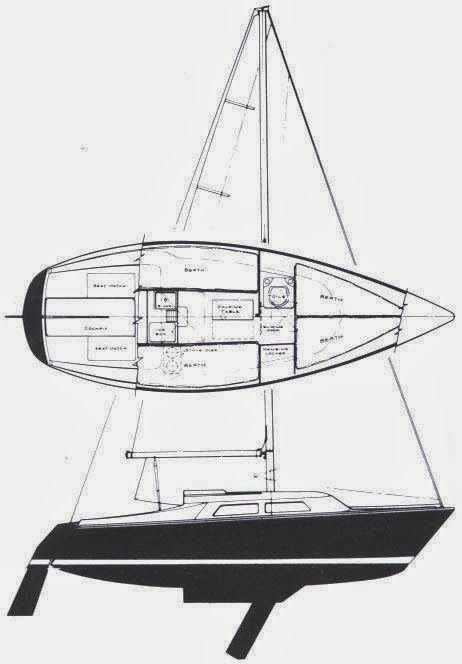 There were 5 of us and the dog, Lucy, aboard the PY23 while travelling, but only my wife and I, and the dog, sleeping aboard. The others stayed in the house my mother grew up in; constructed about 81 years ago. Mom is 84 and took the tiller for part of the way out. 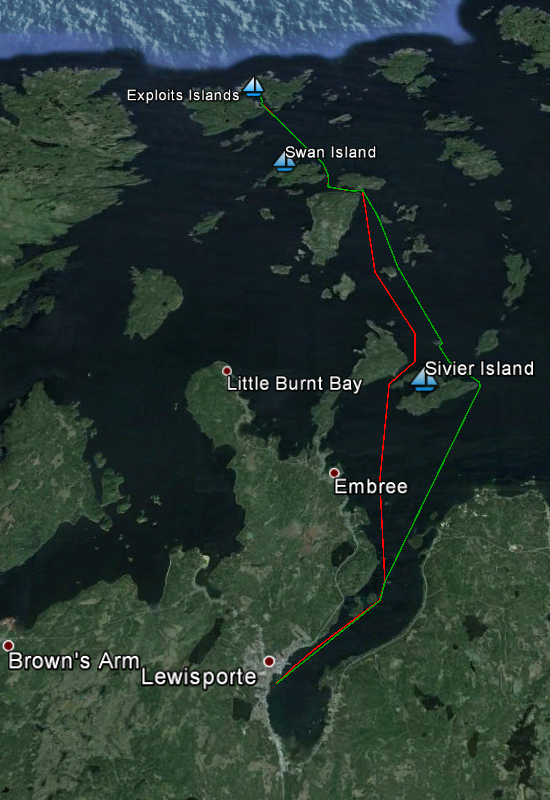 The voyage was about 4.5 hours each way from our home port of Lewisporte. One of my favourite spots on the boat. Birchy Tickle ahead. 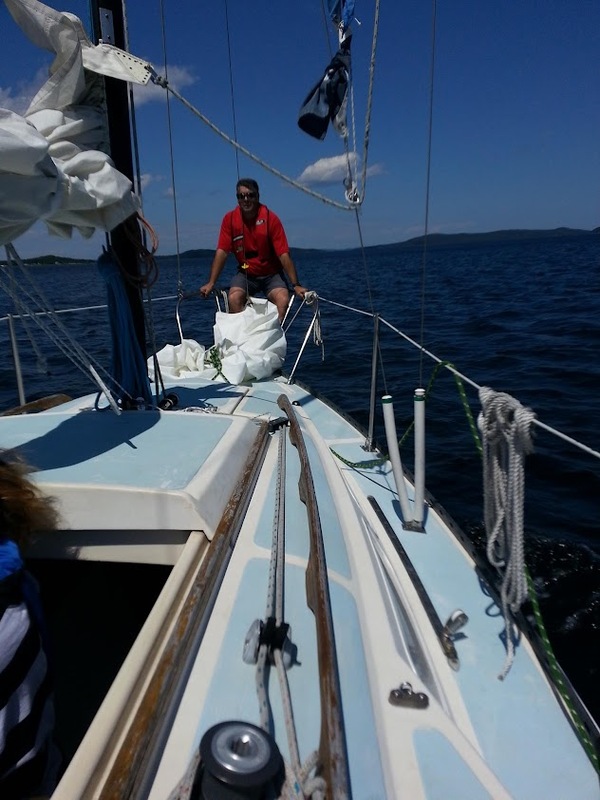 Winds were too variable for sailing so we just motored out. 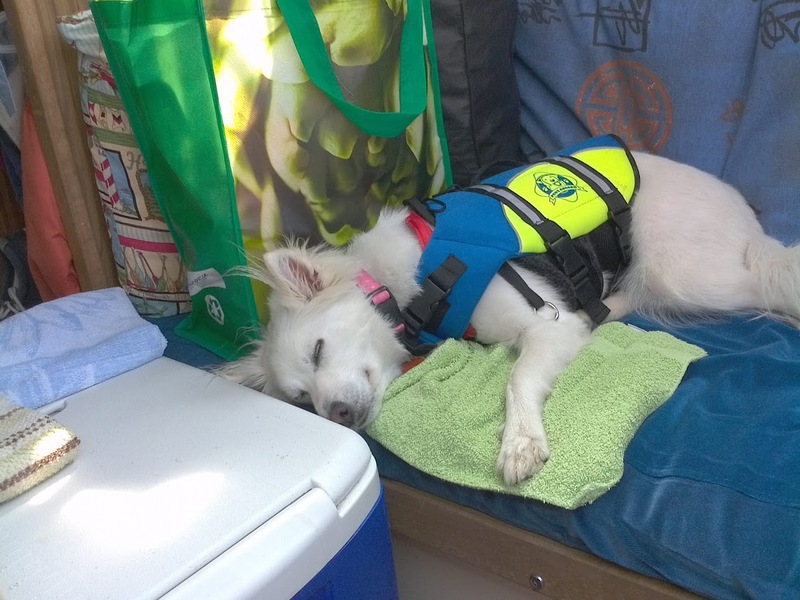 The dog, Lucy, seemed to be enjoying the boat too. Most of the way the waves and wind were somewhat behind us, but variable in both speed and direction. 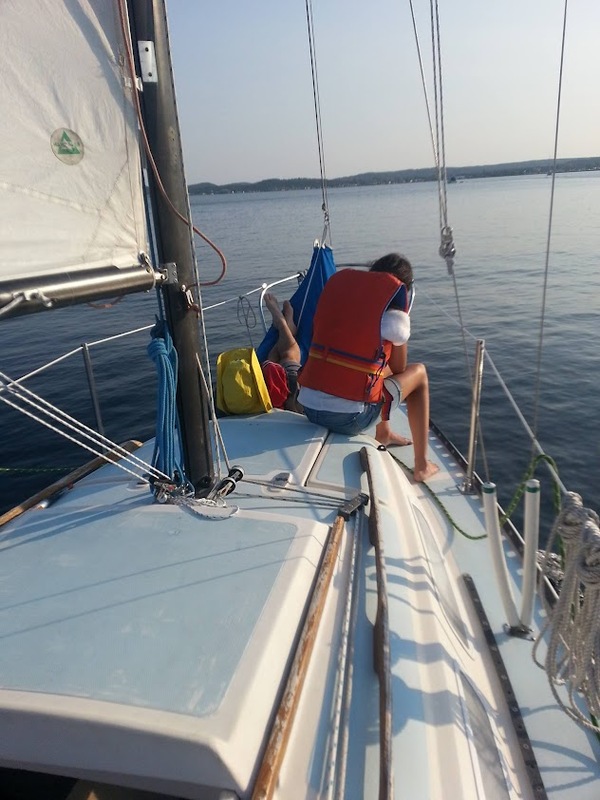 After a while, we gave up trying to sail, and just motored out. After clearing Swan Island it was a different experience. That final stretch of water had the wind and waves on our port bow. It was cooler with the northwest breeze, and chilly spray kept washing those of us who remained in the cockpit. 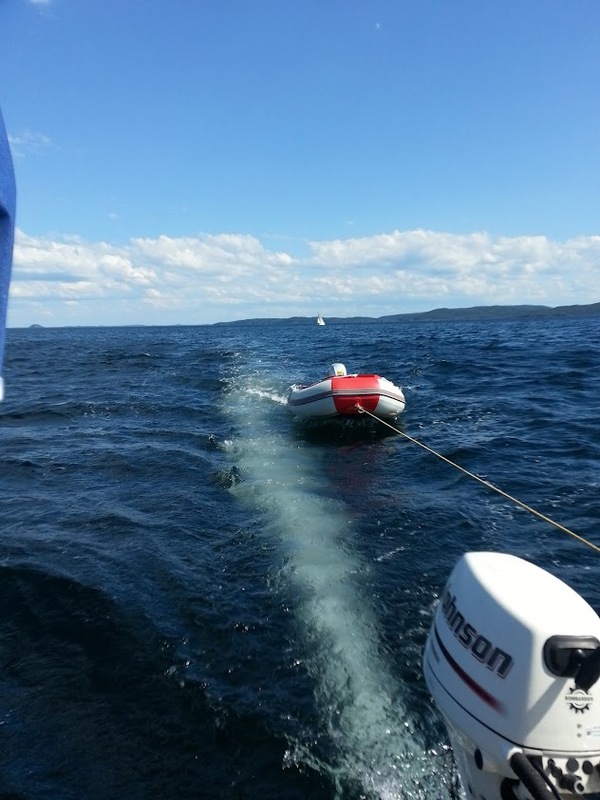 It was a rough crossing, but nothing the boat couldn't handle easily. Once we arrived at Exploits, and the boat was docked, we had to transport all the food, bedding, and so on to the cottage, and open it up for the season. This meant doing a bit of a tidy, and hooking up the water line, propane range, and fridge. I sold the cabin back in 2006 to finance the purchase of my sailboat, but since it has remained in the family, we still get the use of it. Best of both worlds, I think. 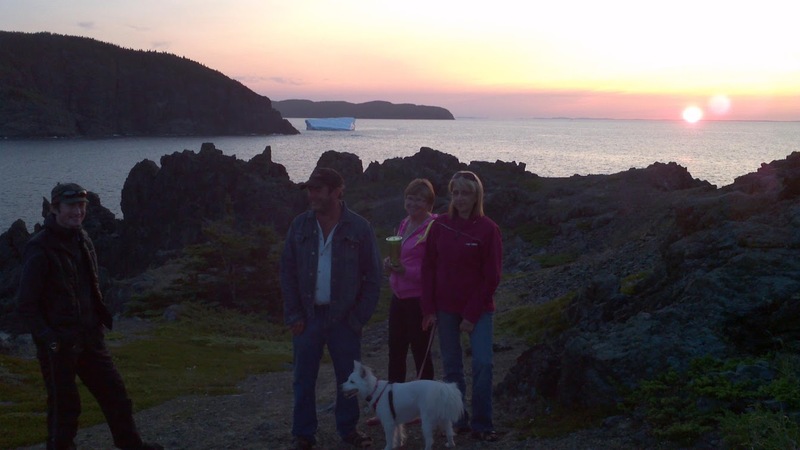 Following supper, Nancy, Rachael and I decided to see if we could get some ice from the chunks breaking off the icebergs. We saw several about the size of a kitchen table floating past the entrance to Upper Harbour as we had approached Exploits. 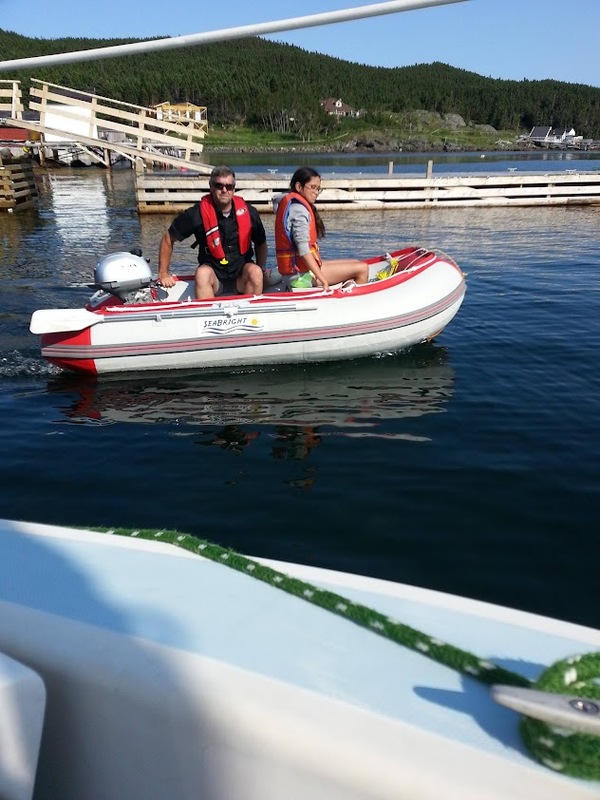 Using the tender, we took the opportunity to also tour the harbour. With no small ice to be seen on the south side, we headed for Lower Harbour. 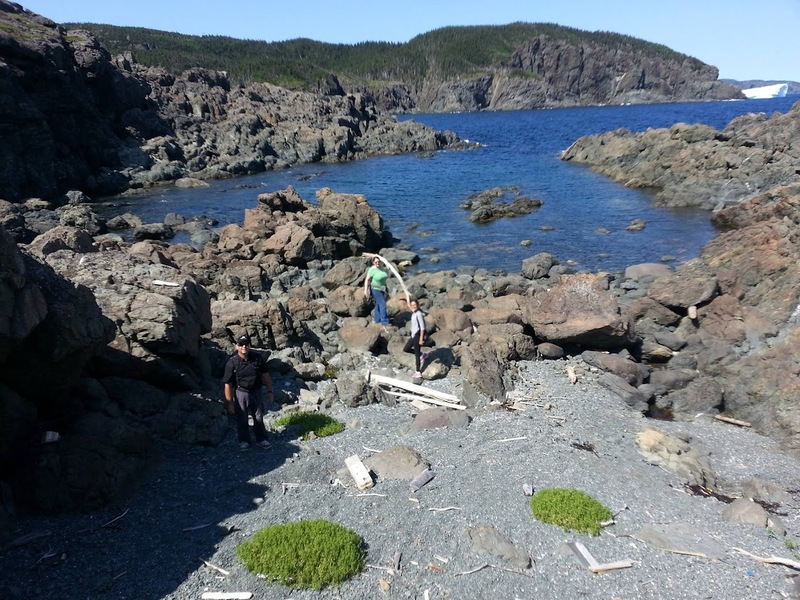 At first we didn't see anything, but after a turn around the cove, we spotted a piece. It was far too big to get into the little boat, but it had an anvil shaped section that a rope could be put around, so we tried towing it. The little 2.3hp Honda, however, was not up to the task, and we had to try plan B. I had brought along an axe, and was able to chop off a few pieces we could scoop into the boat. Once we had enough to help keep the coolers cool, as well as our drinks, we headed back and relaxed for the rest of the night. 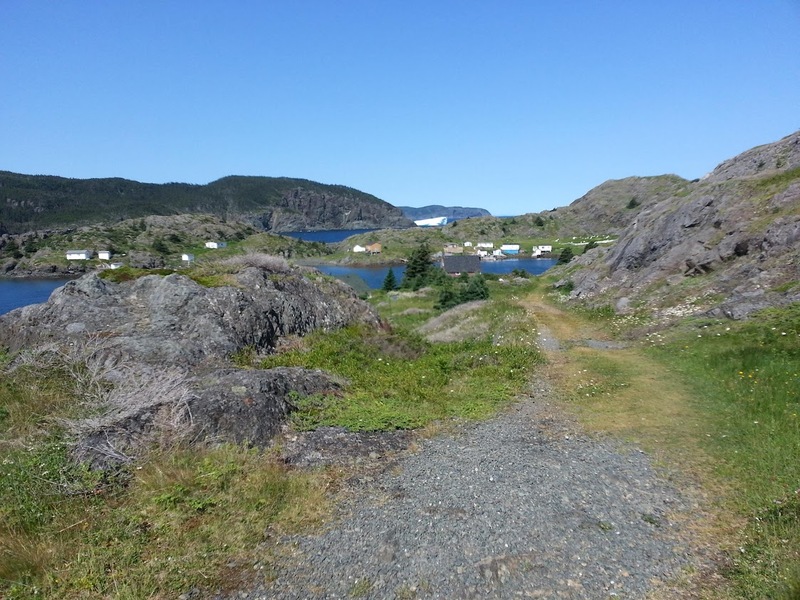 On Saturday morning we all went for a hike down to Lower Harbour. Along the way, Rachael and I climbed up a hill while the others waited below. We had a great view of Upper Harbour, and across "The Run" to Swan Island. 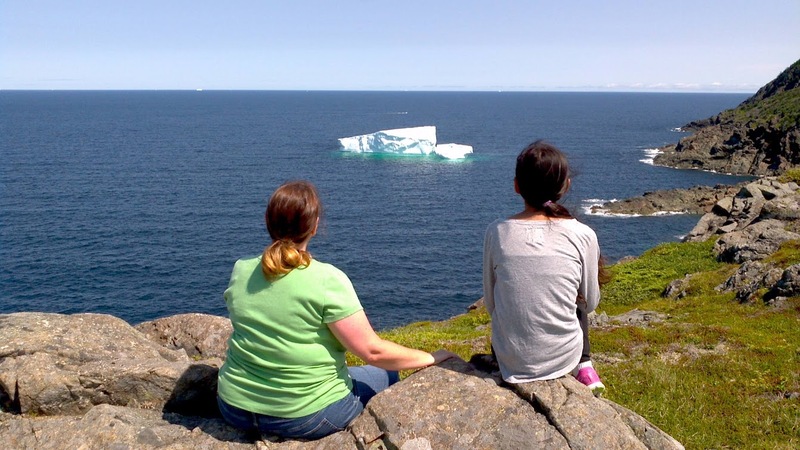 Even though there were a couple of icebergs out that way, we could not see them from here. Rachael on a lookout. The cottage is left of the little island, in the field. The narrows between the harbours where bridges used to be. One of the reasons for this climb was to find Rachael's first Geocache. There are two on Burnt Island, and this was the closest to us. With the ups and downs, and trees in the way, it took a while to make our way, but it was there. Mission successful! Rachael near the cache. Note the icebergs on the horizon. With the first find under our belts, we hurried down and met up with the other three on the trail. We briefly stopped by my cousin Rosemary's place, and admired the new deck, and continued on to the breakwater. This structure is probably over 100 years old, and built without the assistance of any heavy machinery. It was made to stop storm surges from coming through a narrow gap in the hills into Lower Harbour. The breakwater is just left of the white building and cottage under construction. Grounded iceberg background left, with part of breakwater foreground right. The beach beyond the breakwater is a fun place to explore and see what is among the flotsam. For those who know how to do it, there are many potential whistles there. Rachael didn't quite master it. From there we went through the old cemetery, past the headstones of my 3x great-grandparents (James Wells b.1790 - d.1871), and on up to the lookout. This vantage point offers views of the North Atlantic where the next landfall is Greenland. That is where all these icebergs are coming from. Nancy and Rachael look out over the ocean. From there we went after the second Geocache. This one was on a trail I can't remember being on before. 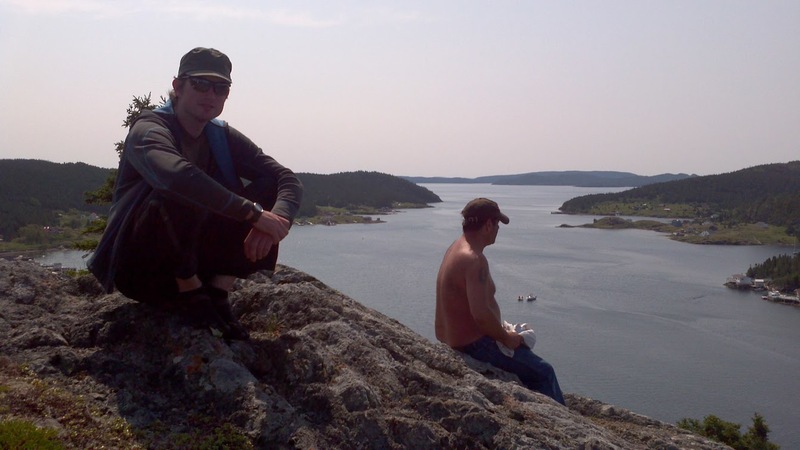 That is the great thing about Geocaching. We had no trouble finding it, but the contents were wet, and the log impossible to sign. 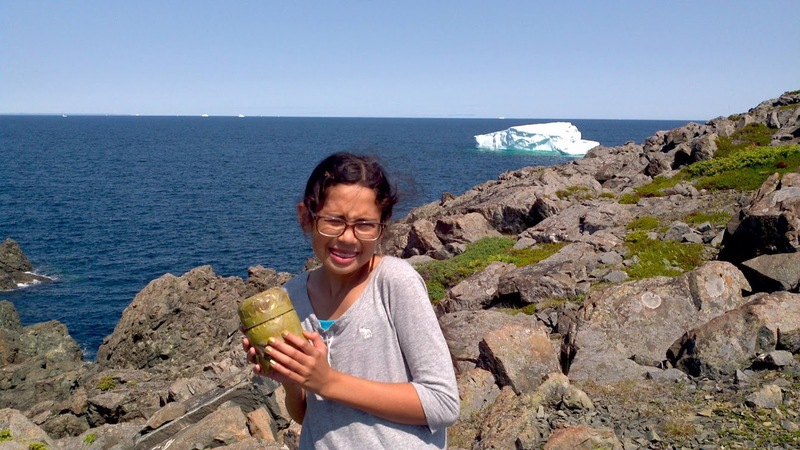 Rachael finds her second Geocache. In the afternoon, I borrowed a boat and taught Rachael how to row. We stayed in the sheltered waters created by the high tide. Rowing is one of my favourite things to do in a boat. As a kid I would take my grandfather's little wooden punt on the same route. As it was getting later in the afternoon, we were wondering where our expected friends were, so Rachael and I went to the mouth of the harbour to have a look for them. There was a sailboat over by Swan Island that might be them, and it looked to be about an hour away. 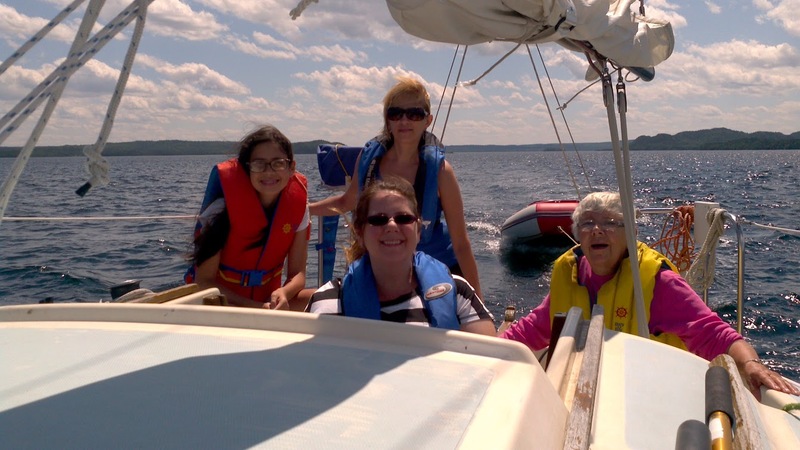 We stopped for brief chats with people on boats, and Rachael got the chance to drive a boat with an outboard engine. Rachael and I go looking for Shelby Lynn. Eventually they arrived. Steve and Joanne have a Challenger 24 (aka Challenger 7.4), and this was Joanne's first trip out this far from the marina. 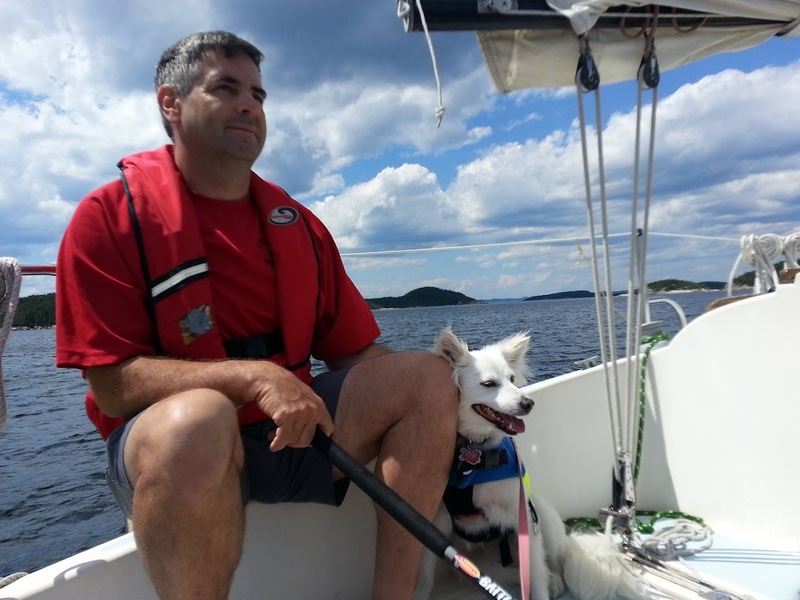 They were accompanied by Lloyd, a visitor from Ireland, who is working in Lewisporte for just the summer, and then heading back home following a cross-Canada adventure. After we had them snugged down on the next wharf, we set about to make supper. 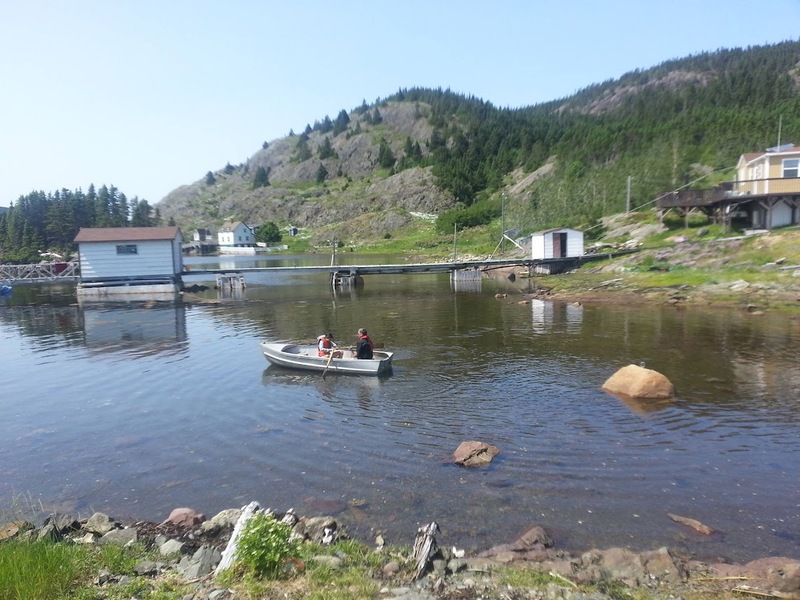 Once the supper dishes were cleared away, it was decided to go for a walk to Lower Harbour, and be back before dark. It was the first time there for both Joanne and Lloyd. We didn't have time to take in too much, but it was a nice stroll. Sunday morning, after a good breakfast, we went off to explore most of Burnt Island. We first climbed up to the nearest look out, back to where the cache was hidden, and then headed south as far as the trail goes. It ends at a house that no one has lived in for a long time, and it has recently collapsed. A sad end to a familiar sight at the harbour entrance. Lloyd and Steve taking in the view. 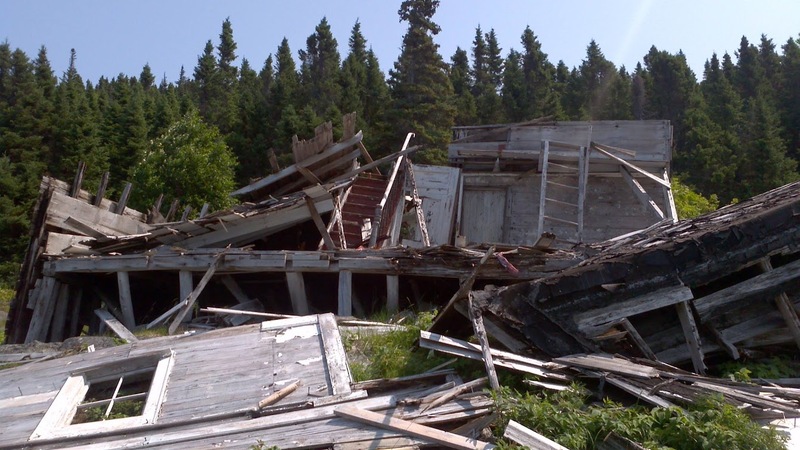 An abandoned house finally succumbs to disuse and old age. Upper Harbour through some trees. 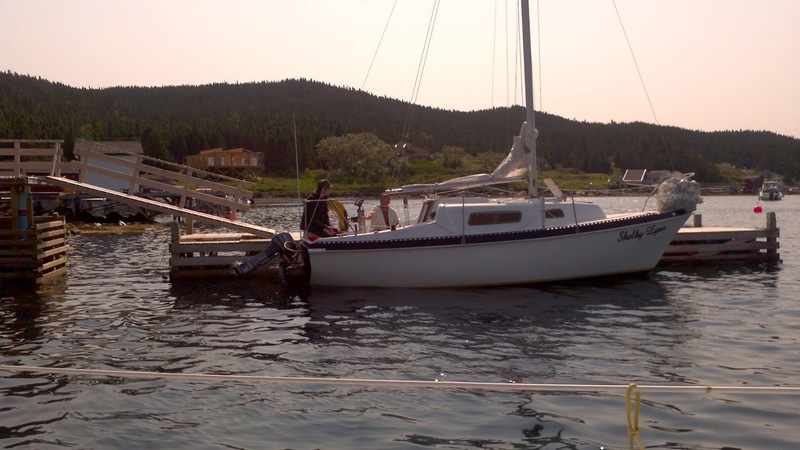 After lunch we loaded up the boat, and prepared for the sail to Lewisporte. There were many things left that we could have done, like walk through Taylor's Nose, and hike out to the lighthouse, but those are thing to look forward to on the next visit. 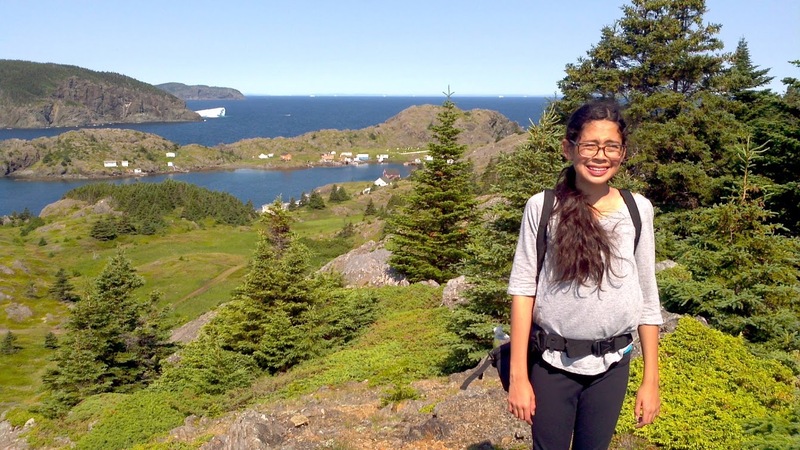 Shelby Lynn took a different route back which offered a closer pass by the icebergs. Shelby Lynn taking the western route back. 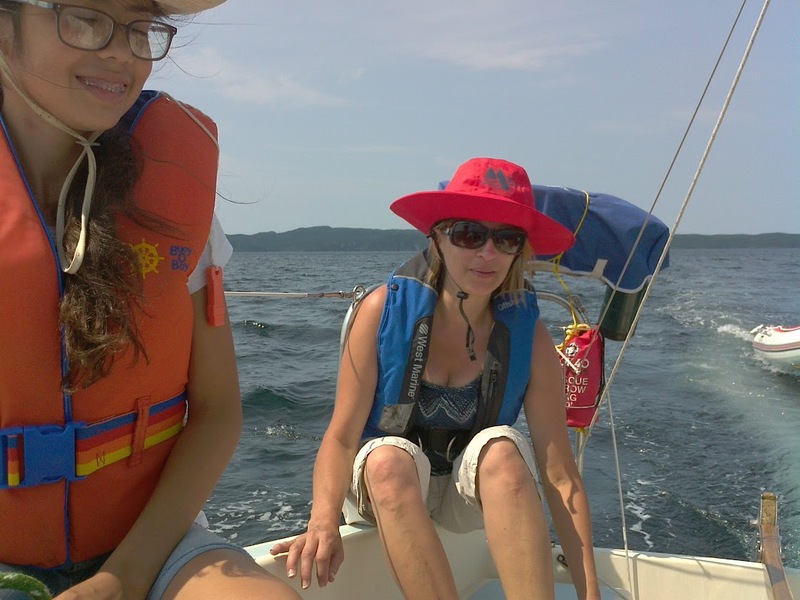 This was the first time my wife has been away from the dock in our boat since 2006, when she nearly fell overboard because of a wet deck and slippery boots. The intention was to make it as comfortable as possible for her, so that she might go out again in less than 8 years. 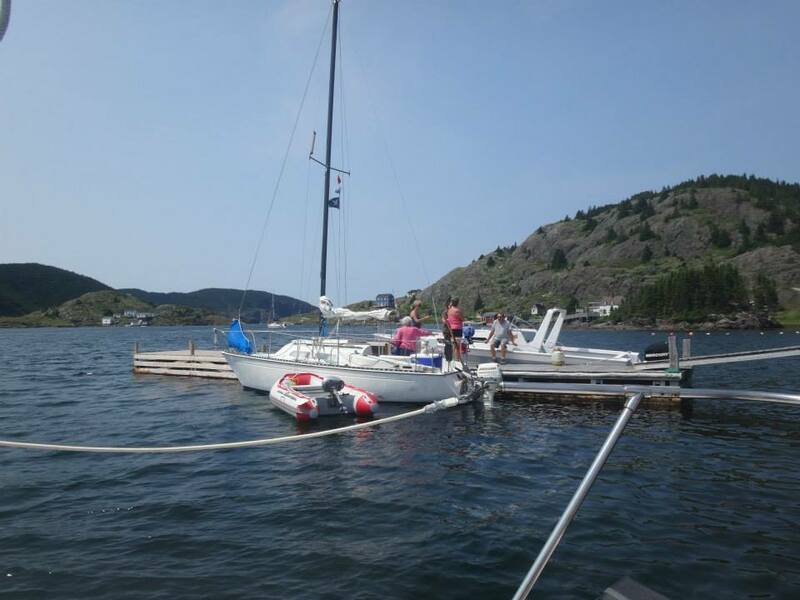 The trip can be done in under 4 hours, but I didn't push the boat over 5 knots, or use very much sail. 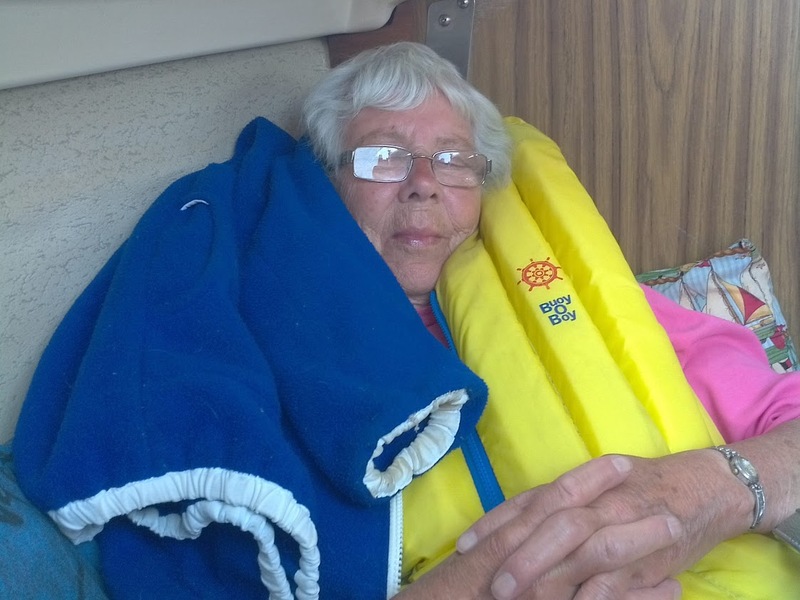 Roxanne even took the helm for a good portion of the return voyage. 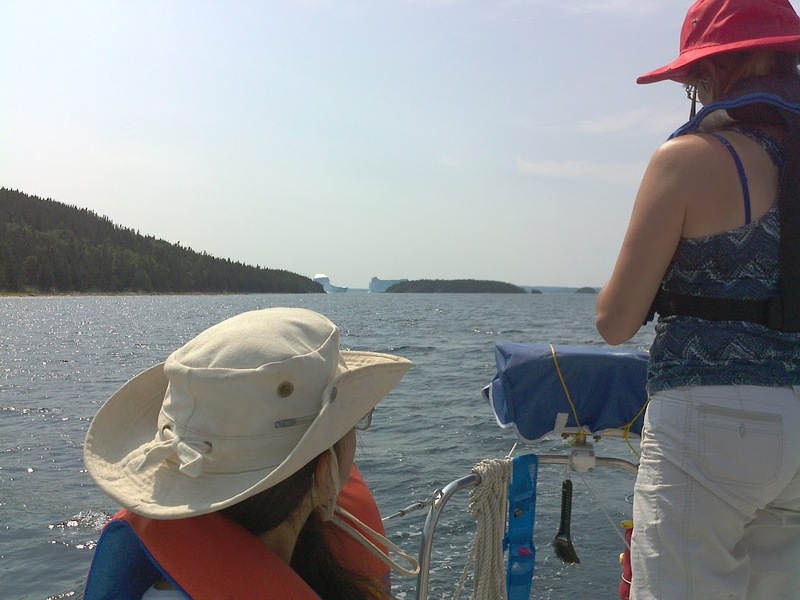 This has been an exceptional summer for both weather and icebergs. 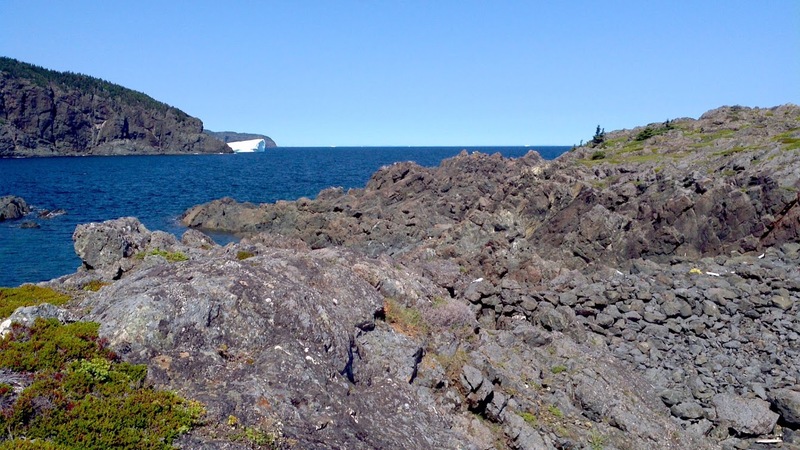 You can be enjoying 30ºC temperatures while watching huge chunks of ice drift by, or go aground and break up. 2 icebergs on the west side of Long Island. Icebergs are not formed locally. They break off (calve) from the glaciers in Greenland and float down our way over a couple of years. They are quite a bit smaller by the time they reach us, and some are still gigantic.You have to be very careful around them, since they are prone to collapse without warning, followed by some big waves, as demonstrated by this YouTube video taken near where we were boating. 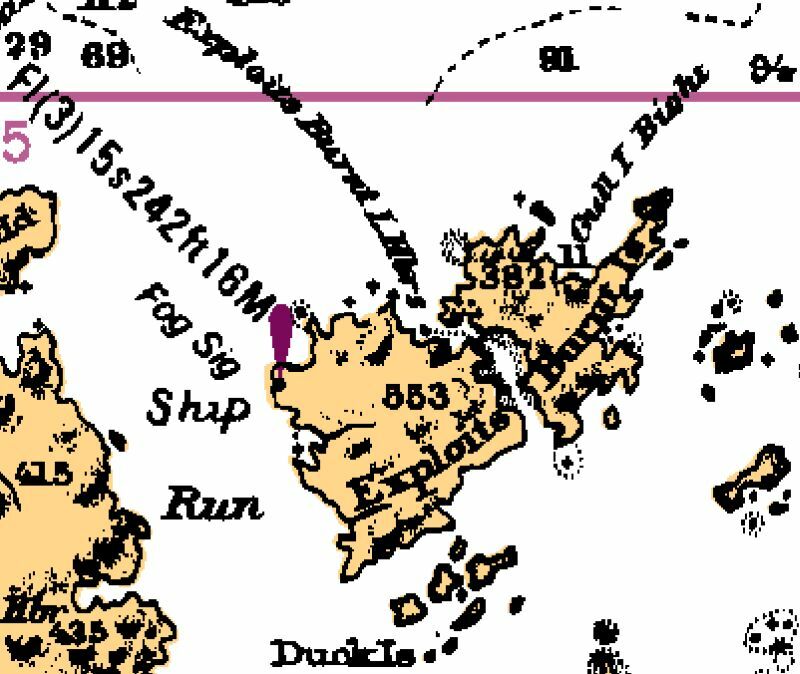 We motored across The Run, and put up a reefed main to motor sail as far as Tinker Island. This is where we dropped hooks over the side and attempted to catch a cod. It was not an ideal spot, but I didn't know how the boat was going to drift with the dinghy in tow. By the time I was satisfied that it would work fine, the women were tired of fishing and requested that we carry on home empty handed. Passengers down below were relaxed enough to sleep. While passing the eastern side of Sivier Island we raised the full main in the diminishing airs, and made the final push back to Lewisporte. It had been a very full weekend with much time spent on both the land and the water. 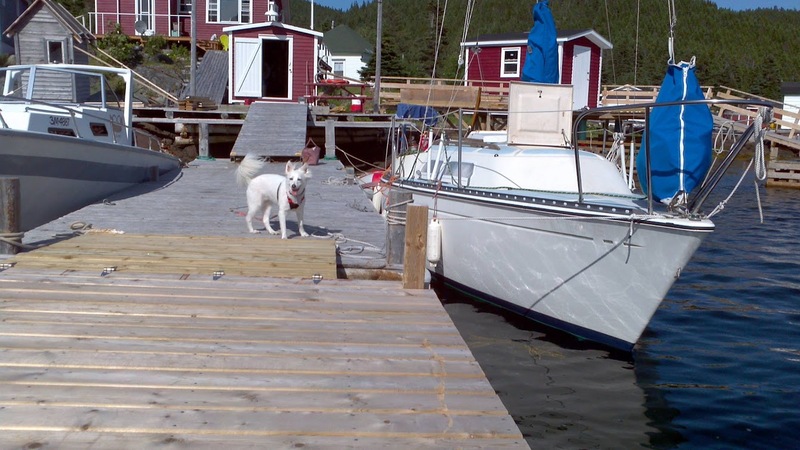 Nancy and Rachael are looking forward to another visit to Newfoundland, and Roxanne might even go out in boat again.